Winner of Best YA Fiction 2015. Now with a stunning new cover and a second edition with great new content that fans of the series will love. Honor does not bend. A will of iron does not break. Victory lies within the ashes of destruction. The Vapros, the Taurlum, and the Celerius: three dynasties bound by an ancient promise, and given superhuman abilities to protect the city of Altryon from the dangerous world beyond its walls. The Vapros have the ability to teleport and turn their enemies to ash, the Celerius have super speed and the ability to heal from any wound, the Taurlum have skin like steel and godlike strength. Centuries of petty infighting have turned the families against each other, resulting in a secret war. A powerful emperor now rules over all, as the families have weakened by massive casualties. 16-year-old Neil Vapros desperately wants to become an assassin, to please his hyper critical father. After failing his first mission, Neil learns that a sinister new force has awakened. This mysterious new power threatens to shatter the established order and threaten the lives of everyone in Altryon–regardless of their family name or allegiance. Winner of numerous national awards including: Best Book in Florida and Best Fiction for Young Adults 2015 from the Florida Authors and Publishers Association. 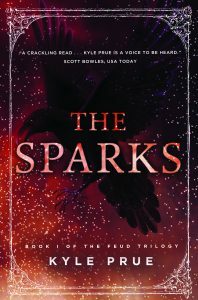 The Sparks was runner up for Best Young Adult Fiction at the Florida Book Festival and won Honorable Mentions at the New England Book Festival, Midwest Book Festival, Southern California Book Festival, the International London Book Festival and won a prestigious Indie Fab award. Prue also won an International Moonbeam Award for Best Young Author. Kyle Prue is an award winning author, actor and comedian. Prue wrote The Sparks when he was just 16 years old. He will complete the series with The Flames and The Ashes. He has spent the past year on a national book tour visiting over 60,000 middle and high school students. Prue is also a popular keynote speaker at conferences and events. He is currently a freshman at the University of Michigan, studying acting and creative writing. Prue is the founder of Sparking Literacy, a non-profit dedicated to lowering the high school dropout rate by inspiring teens to read, write and follow their dreams. An actor and comedian, Prue trains at Second City Comedy Club in Chicago, where a number of SNL actors have gotten their start. Prue currently lives with his family in Petoskey, Michigan.